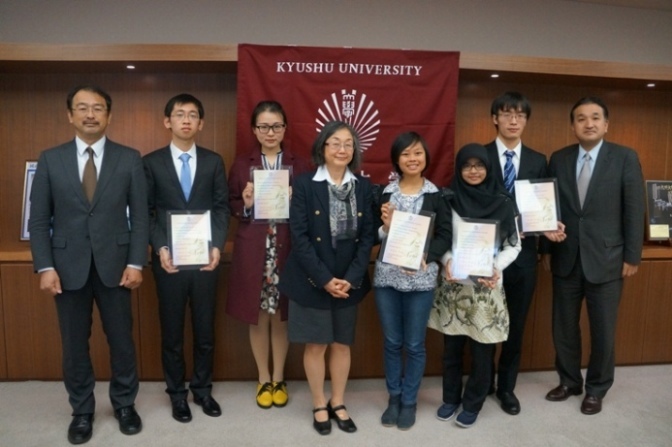 Under Kyushu University Friendship Scholarships Scheme (hereafter Friendship Scholarship), Kyushu University invites students from abroad who attend prestigious universities in their home country and who will play an important role in their nation’s future. By offering them a chance to study abroad at Kyushu University, the scheme aims to foster the nation’s future leaders, maintain good relations with Kyushu University, and play the role of point of contact to cultivate joint research and bring in external capital depending on their course or career after graduation. ・Students who are enrolled in non-Japanese universities. ・Students who can pay the tuition fee when they come from non-Japanese universities which doesn’t have agreement of student exchange with Kyushu University. Grants are as follows in principle. a) Round-trip economy air ticket via the most direct route between Fukuoka and the location of the recipient’s university. Air tickets and transportation fees in the recipient’s home country will not apply unless receipts and other proof of purchase are made. b) Incidental Expenses Only expenses incurred through visas, travel taxes, and airport taxes will be borne by Kyushu University. In the event that receipts and proof of payment are not submitted, these expenses will not be covered. * Both your period of enrollment at Kyushu University and the length of stay in Japan must be more than 16 days of the month concerned in order to receive a monthly stipend.